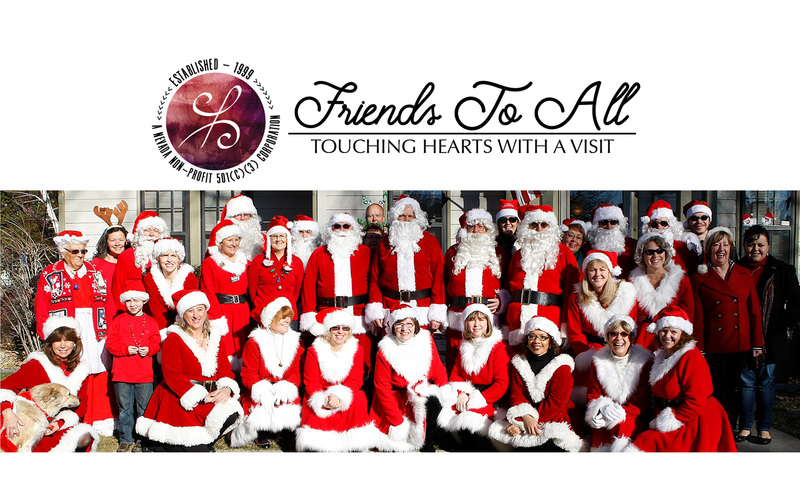 Friends to All is dedicated to bringing joy, cheer and friendship to senior citizens in our community especially during the holiday season. Since 1999 Friends To All has been working to meet the needs of those with limited financial resources who are home bound or in care centers with little or no family nearby. Each year we average 150 – 200 visits in the Carson City area! In the month of December, our volunteers are grouped into teams dressed as Santa Claus and Helpers to meet seniors in our community delivering a wonderful visit with gifts provided by individuals and businesses. The joy on the faces of those we visit when they open their door and see Santa Claus bringing a gift and having their photo taken with the jolly fellow is quite a meaningful experience! We work closely with RSVP (Retired Senior Volunteer Program) and call on many of their clients and appreciate many of their volunteers assisting in our visits. We are also able to accept monetary donations payable to “Friends To All”. We can then provide the 501(c) 3 Tax Deduction information for your donation. We typically use the monetary donations for grocery store gift cards given to those in need.